With a history going back over 200 years, Eastern bank is the largest and oldest Mutual Bank in the Country. The company needed to deliver better services to employees, reduce paper transactions, and deliver Payroll to employees. Being a highly regulated industry, Eastern Bank had complex processes and high security requirements. By implementing Oracle HCM Cloud, Taleo Talent Management, Global Payroll, including Time & Labor, Eastern now delivers a full suite of benefit plans and coverage, and has integrated book keeping systems and GL. 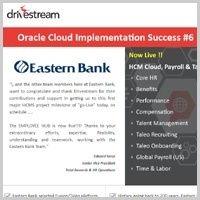 With performance like that, Eastern has taken Oracle HCM Cloud to the bank! Hillside Family of Agencies a non-profit human services organization delivers diverse set of services for children and families, and people with mental illness and developmental disabilities, including foster care, education, tutoring, etc. Diverse services mean diverse funding streams, and with 80% of expenses relating to payroll, Hillside has many cost allocations. 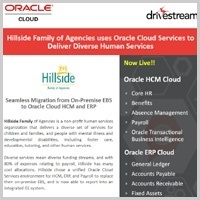 Hillside chose a unified Oracle Cloud Services environment for HCM, ERP, Payroll to replace their on-premise EBS, and is now able to report into an integrated GL system. As a non-profit, they needed lower Total Cost of Ownership with Cloud IT so they could spend time leveraging the functional capabilities of the system, rather than worry about keeping the servers turned on. Delaware Life Insurance Company, through its insurance subsidiaries, is a leading provider of annuity and life insurance products in the United States. It was established in connection with the purchase by Delaware Life Holdings, LLC of the domestic US annuity business and certain US-based life and corporate markets insurance businesses of Sun Life Financial Inc. As part of the Sun Life divestiture, Delaware Life took over the assets of Sun Life but not its infrastructure, requiring that Delaware Life set up a new IT infrastructure within a short time frame.